Pencil drawing by Frederick Charles Maisey of architectural details from a building in Chanderi, taken from an album of 60 drawings dated 1847-1854. Chanderi was an important administrative centre in the Muslim sultanate of Malwa. As a strategically located city it was later seized by Babur in 1528. The town is dominated by the fort that sits on a flat-topped hill overlooking the valley of the Betwa river. The fort was approched through five gates, only three of them having survived. It was seized by the British under Sir Hugh Rose in 1858. The monuments in Chanderi are interesting for their mixed style. The use of recycled temple columns, trabeate methods of construction and small domed kiosks or 'chhatris' found in some buildings are elements drawn from earlier Rajput traditions which are then used with Islamic elements, notably the dome and arch, imported from Delhi, Malwa and Gujarat and Muslim countries to the west. The Ghori and Khalji sultans of Mandu built extensively at Chanderi including mosques, tombs, palaces and tanks. Inside the fort itself are two Hindu palaces built by the Bundela Rajputs. 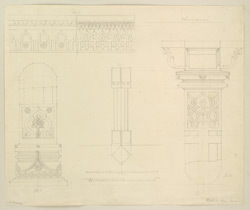 This drawings depict the elaborate geometrical and floral patterns of some of the pillars and mouldings.